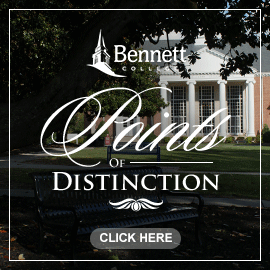 As a partner, your support will help us develop, enhance, and implement innovative career development programs and services for students of Bennett College. It is through the generous support of our employers (like you) that we can extend our services and programs beyond our institutional capability. The Office of Career Services Freshwoman to Internship Support Program will provide students access to experience through internships. This program is selective. The OCS will ensure all students are aware of its importance, and for applicants to be aware of deadlines and expectations so that they will be prepared to meet your requirements in advance. For a student to become eligible to the Office of Career Services’ Freshwoman to Internship Support Program (FISP), prospective applicants must attend two information session offered. Please see below. Seeking a long-term commitment is required. All application materials must be complete and submitted to the Office of Career Service by TBD. No, exceptions. Late applications will not be accepted. Applicant must have attended the required information session and webinars (if provided) to be eligible. Stop by the Office of Career Services any time during business hours for assistance. A committee of the Office of Career Services will vet and screen the student(s), and the employer will make the final decision on each application. Emphasis placed on applicants’ personal statement with support from the resume, transcript, and employer form. A competitive application is one that successfully demonstrates the applicant understands of the link between her goals, past experiences, and the opportunities afforded by the internship in question. Rising Juniors and Seniors will receive priority, but all classifications are a consideration for this process. Awards are NOT transferable to internships outside of the scope of the application. All criteria are required by the students and are conditions of the internship. Student’s failure to comply with conditions will jeopardize their current and future in the Freshwoman to Internship Support Program (FISP).